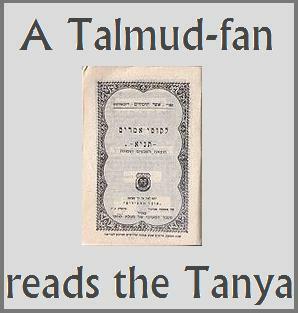 Having decided to begin a project to read and write about the foundational work of Lubavitcher Hassidim, the Tanya (a/k/a Likkutei Amarim), here is my first post, with my thoughts on the first chapter of the ספר של בינונים. I like how Rabbi Shneur Zalman of Liadi does a nice job of presenting two [potentially] conflicting tannaitic texts at the outset, although Rabbi Zalman leaves them and says not to go in either extreme direction of becoming depressed at being wicked or at becoming too casual about living. I must say it is an interesting insight about if one feels that they don’t have enough going their way that they will end up feeling depressed and not being in a good mood. However, he seems to espouse a value of being joyous and of serving God happily (albeit without explanation). Similarly, he sees a problem with casualness, but why? So, what? He doesn’t explain. 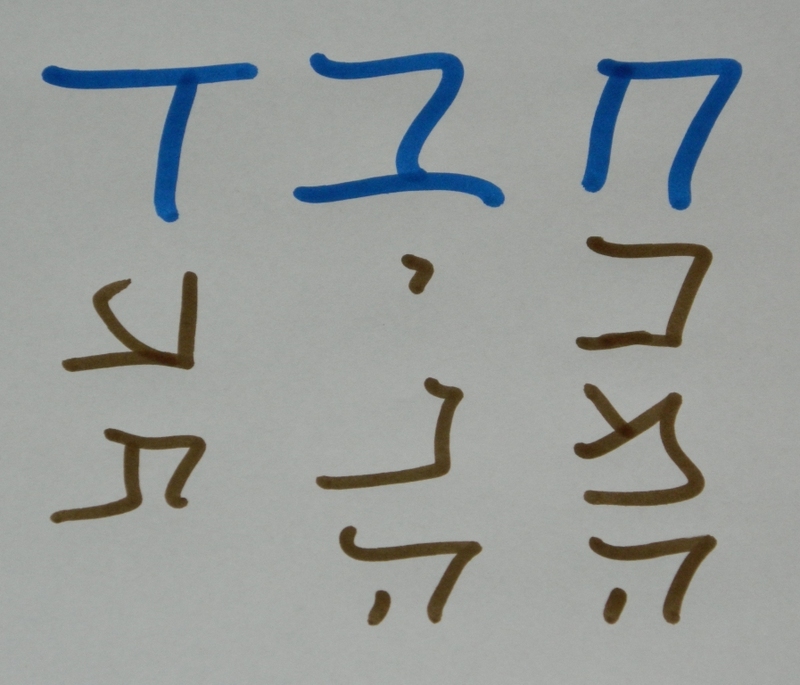 But what’s seemingly bizarre to me is that he throws in חס ושלום – really; it’s that bad? I hope he explains that concept later…. I like that he uses quite a few Talmudic excerpts – I like that and feel like I’m in a familiar territory. However, I’m on guard about how Rabbi Zalman will use them, of course. It’s a bit strange that Rabbi Zalman quotes Rava saying that Iyov was saying “you created wicked people and you created righteous people” (BB 16a), yet he then somehow says that someone is not both wicked and righteous, somehow finding it problematic that one could be both. It is a piece of interest that Rabbi Zalman then investigates who is a בינוני- who is a medium/middle sort of person (since there are the five types). And it definitely seems right to me for him to reject the possibility of someone who has more sins than merits to be considered a wicked person and someone who has more merits than sins to be considered a righteous person, leaving only the person who has their sins and merits balanced to be considered a medium person. That leaves very little area for such medium people. Plus, those are very low barriers for someone to be considered either a wicked person or a righteous person! Rabbi Ammi said to him (Rabbi Abba, son of Mamal): Because I maintain that whosoever observes the words of the Sages may be described as virtuous. Said Raba: Would then one who does not observe the words of the Sages merely lose the designation of virtuous man? But would he not be called wicked? In both of these dialogues, Rava is trying to point out the converse relationship of acting in accordance with the words of the sages being called either virtuous (by Rabbi Ammi) or holy (Abayye), thus resulting in someone not heeding the words of the sages as potentially being called wicked. Yet, he is merely posing this as a question, challenging Rabbi Ammi and Abayye, since he finds this to be a problematic position, largely since he had a lot of interaction with Jews who did not heed the words of the sages (in composing this paragraph, I realized I need to put up a separate post about Rava and his interactions with such Jews in his town – check back on Tuesday for that post (as part of “Talmud Tuesdays”)). However, what is shocking is that Rabbi Zalman takes this querying statement as a definitive statement on the matter, as he says ואפילו העובר על איסור קל של דברי סופרים מקרי רשע כדאיתא בפ”ב דיבמות ובפ”ק דנדה! In fact, Rava’s position is just the opposite: that one who doesn’t heed the words of the Sages is NOT called a wicked person! Oy. He then says that on who has the power to hold back someone from committing a sin and does not hold them back is called a sinner (ואפילו מי שיש בידו למחות ולא מיחה נקרא רשע), pointing to a Talmudic excerpt (Shevuos 39b), which is a weak proof, wherein there is a stammaitic comment, seeking to resolve two conflicting tannaitic texts: התם שיש בידם למחות ולא מיחו (“There [they are punished], because it was in their power to prevent [the sin], and they did not prevent it.”). Not a strong proof, but at least it’s something upon which he can hang that statement. While Rabbi Zalman is picking out Rabbi Nehorai’s opinion amongst a handful of other sages, he actually picks the most easily possible to occur for Jews (since those who worship idols could be gentiles, too). While Rabbi Zalman could have selected one of the other options, his selection points to a belief that every Jew [who is capable of studying Torah] should be studying Torah and perceives this as a fundamental activity in which they should be engaged. To do otherwise (i.e. to not study Torah for those for whom it is possible) would not only be losing out on an opportunity, but to be despising the word of the Lord. By picking out this tough opinion, it seems that Rabbi Zalman is trying to create a strong minimum observance on the part of Jews. After that, he returns to the matter of a בינוני, concluding that someone who has more merits than sins is not called a צדיק. 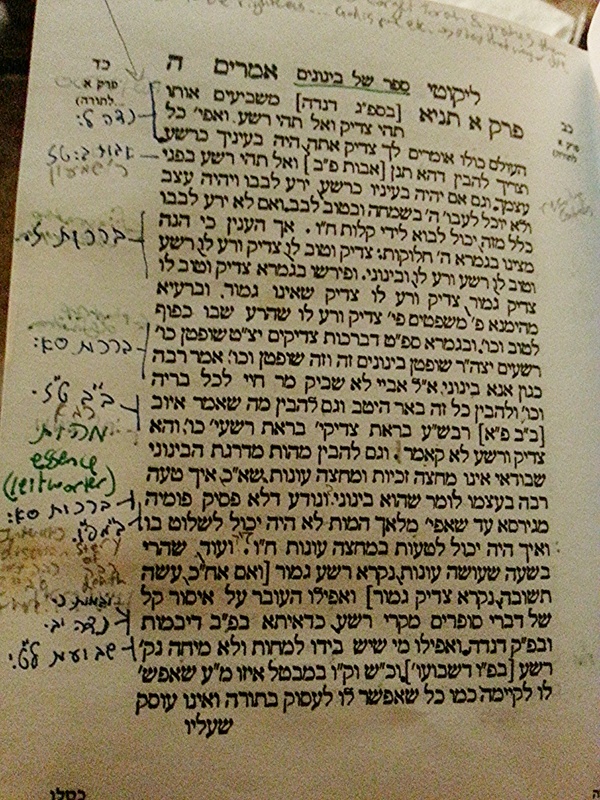 The last section of the chapter switches directions a bit and quotes Rabbi Hayyim Vital, wherein he says that there are two souls, the first of which is from the mere husk, from the other side (unholy), which leads to such bad things (in Rabbi Vital’s opinion) as anger, haughtiness, desiring physical pleasures, frivolity, scoffing, wasteful activities, laziness, and depression. The other soul yields all manner of good things found in nature, which are found amongst the Jews, such as mercy, and loving-kindness. 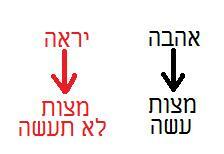 In his opinion, only Jews have both types of souls, whereas gentiles only have the first type of soul. And not only that, but there is not any good within the souls of gentiles at all, since anything that might be perceived as good, is really only done for their own benefit, citing the Talmud (which I wrote about the other day). Well! Yikes, they must have had really negative experiences with non-Jews, Rabbi Vital and Rabbi Zalman, to yield such horrible opinions of gentiles! 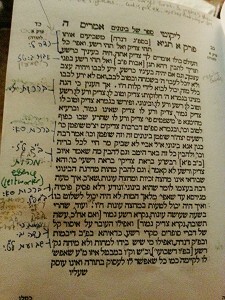 Those opinions are even worse than the students of Rabban Yohanan, son of Zakkai, whose opinions are mentioned in that post, who had to deal with Roman persecution, since the students of Rabban Yohanan, son of Zakkai, only said that they do good but really for self-benefit, while Rabbi Vital and Rabbi Zalman are saying that they are, at their soul’s essence, not capable of doing real good. WOW! One wonders how this sense of one soul for gentiles and two souls for Jews affects the outlook of Lubavitcher hassidim in their views of Jews versus their views of gentiles. – Rabbi Zalman sees a statement of our oath to an angel pre-birth that we are to be righteous and not wicked as a mission statement: how are we to be righteous and how can we avoid being wicked? In order to do this, though, we need to understand how one gets categorized as such. However, in the course of doing so, he comes across not a simple bifurcated division of people, but a pentafurcation: which includes two categories of righteous people, two categories of wicked people, and medium people. After trying to collapse the two categories, each, of wicked and righteous, he then tries to figure out how big these categories are and rejects the notion that the medium people are evenly balanced between sins and merits while if one has an imbalance, they are either a righteous person or a wicked person. – Rabbi Zalman uses Talmudic excerpts as a primary basis for his epistemology, with a secondary basis in kabbalistic works. While I like that he is using Talmudic texts as a foundation for his philosophy, he sometimes takes them either in a direction in which they were not intended (e.g. the Rava texts about wicked people) or picks a very strict position from them (e.g. Rabbi Nehorai’s opinion about not learning Torah), so he’s not exactly taking them in a straightforward manner, but cherry-picking the aforementioned to suit his purposes in demanding a very high level of “minimal” acceptable baseline of practice for Jews. 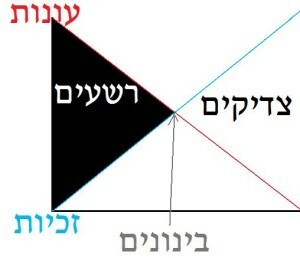 – Rabbi Zalman, utilizing Rabbi Vital, takes a very negative opinion of gentiles, not only opining that whatever good they do is really only for their own benefit, as opposed to some greater good, but also that they are essentially inferior to Jews in that gentiles have not only merely one soul, while Jews have two, but that the soul the gentiles do possess is a lower, more base soul, while Jews also possess a goodly second soul. With such a stark difference separating Jew from gentile, it would be easy for one to see why Lubavitcher hassidim distinguish betwixt them. Chapter 2 will be posted about next week. This entry was posted in Chabad, Jewish Stuff, Tanya and tagged chabad, tanya, Thematic Thursdays. Bookmark the permalink.